Since 1987, Southwestern Car Care has provided motorists in the Arbutus, MD 21227 area with comprehensive auto repair services. Our goal is to offer the best services available at affordable prices to get you back on the road in no time. You'll be hard-pressed to find the same level of expertise that our auto mechanic specialists provide! We have years of experience working on both domestic and import vehicles of all makes and models and can work with you to find cost-effective repair and maintenance alternatives. We fully guarantee the work of our mechanics. For a high-performing vehicle, trust Southwestern Car Care with your car, truck, or van. To learn more about the services we offer, please contact us by phone at 410-242-3110 or use our contact form. We also invite you to learn more about our dedication to you, our valued customer. Here is some valuable information on brake issues and corrective services Southwestern Car Care offers. In a disk brake system, rotors are attached to your vehicle's wheels. When the brake pads grip the rotor, they bring both the rotor and wheels to a stop. However, the friction causes grooves and cracks to appear over time. Resurfacing brings the rotor back to a "like-new" condition, reducing squealing and wobbling. Southwestern Car Care will give your rotors a thorough inspection and recommend your best course of action. 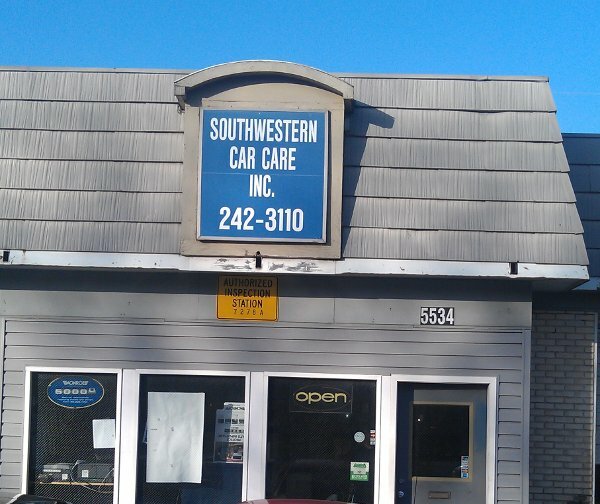 Rely on Southwestern Car Care in Arbutus, MD 21227 to provide quality care for your vehicle's undercarriage. Stop by our shop to see how we can help you or call 410-242-3110 for more information.